Category Archives for "Energy Giving Foods"
Foods that give you energy and help you to perform at your best each day. Each of these vegetables, fruits, oils, nuts and seeds are powerful energy giving foods for better heath. Pumpkins are one of the most overlooked foods in terms of health benefits and nutrients. It seems many people’s only exposure to this extremely healthy food is sugar laden pumpkin pie at Thanksgiving or Christmas. Even worse, millions of pumpkins are hollowed out for carving at Halloween, with the pumpkin meat and seeds, probably about the healthiest thing in the kitchen at the time, never used. Pumpkins deserve better. In fact, with the incredible array of health nutrients in pumpkins, they should really be considered a superfood. And one we’d do well to eat a lot more often. Also ahead is how avocado helps high blood pressure and constipation, why it’s beneficial as a arthritis treatment, important for pregnant women and has even been shown in studies to help you live a longer and healthier life. Here’s a list of the top 10 benefits of eating avocados and just why they are considered so good for you. Many people are still under the impression that nuts like almonds are fattening. They may think that due to their high fat content and calories that almonds can’t possibly be good for weight loss. In fact, used as a replacement for what the vast majority of people snack on, nuts like almonds are actually an exceptional weight loss food. Here’s why. Losing weight is very difficult with the type of foods most people snack on. This is because packaged products made of processed grains like wheat and corn are very high in simple carbohydrates that stimulate the production of insulin. Pineapple is surprisingly good for you with a potent and unique nutritional profile. Ahead are 6 pineapple benefits for improved digestion, arthritis treatment, better skin, more energy, disease prevention and even using pineapple for coughs and colds. Also, find out when is the best time to eat pineapples and why. Plus the sugar content and glycemic index of pineapple versus their true glycemic load and why it matters if you want to lose weight. Let’s start with one of the most important health benefits of eating pineapples — better digestion. Pumpkin seeds offer a broad range of minerals, vitamins, essential fatty acids, phytosterols, protein and other nutrition that makes them a particularly healthy snack or recipe addition for anyone. There are, however, some specific pumpkin seeds benefits for men, involving hormones, hair loss, prostate enlargement, stress reduction and better sleep. High levels of the hormone dihydrotestosterone (DHT) circulating in the body may cause many health issues for men, especially later in life. DHT is believed to be a prime culprit in both hair loss, leading to male pattern baldness, and prostate enlargement, also known as benign prostatic hyperplasia. DHT attaches to the hair follicles on the head in men, particularly at the temples and on the crown, and shortens their growth phase. Over time, this leads to thinner and weaker hairs and noticeable hair loss. Pumpkin seed oil is a deep green oil, rich in essential fatty acids, antioxidants, vitamins and minerals and other health nutrients. Here is the best pumpkin seed oil dosage, when to take it for the most benefit and where to get good pumpkin seed oil at a low price. Why Use Pumpkin Seed Oil? Pumpkin seed oil is an intensely dark green oil pressed from raw or roasted pumpkin seeds with many health benefits. It has a rich and nutty flavor and is a potent source of beneficial fatty acids, antioxidants and DHT blocking compounds such as beta-sitosterol and delta-7-sterine. 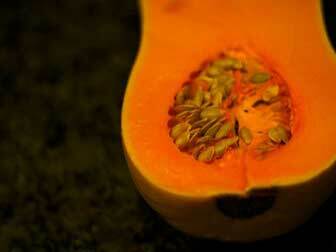 Here are the top health benefits of pumpkin seed oil and 6 great reasons to take it regularly. Looking for an alternative to peanut butter that tastes great and is actually good for you? Look no further than pumpkin seed butter. The delicious way to enjoy all of the health benefits of pumpkin seeds by the spoonful. Here’s why rich tasting pumpkin seed butter is so beneficial for you and much better than peanut butter. Plus my recommendation for the best organic pumpkin seed butter to try. What is Pumpkin Seed Butter?